Hometown Holidays 9th Annual Tree Lighting is December 1st! 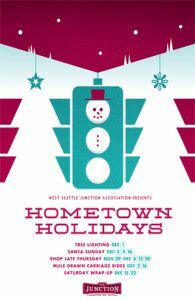 Join us in The West Seattle Junction to kick off Hometown Holidays with our Annual Tree Lighting Event on Saturday, December 1, 2012 at 5 pm! The Junction presents our 9th Annual Tree Lighting Event. It will be held in Junction Plaza Park at 42nd and Alaska. It’s a community event for family, friends and neighbors. Please join us! Marty Reimer from 103.7 The Mountain will emcee the event and the Starlite All-Stars return as the house band! Enjoy performances from the Endolyne Children’s Choir and ArtsWest’s Winter Wonderettes! Come early for refreshments and to pick up a copy of Merrill Gardens’ “Home for the Holidays” Carol Book! Check our Hometown Holidays Events page for the full Hometown Holidays events schedule. Or visit our Holidays page for more information about Seattle holiday shopping and dining in The Junction.